﻿National Signing Day: Calendar, History, Tweets, Facts, Quotes & Activities. National Signing Day marks the start of the college football signing season. There are signing dates for other sports but football's is the most popular one. From this day forward, high school football players can sign a National Letter of Intent to play football for a university in the National College Athletic Association (NCAA). The National Letter of Intent is a binding agreement between a potential student-athlete and a NLI member institution. Once signed, the agreement requires the athlete to attend and represent the institution for at least two semesters or three quarters, and in return, the institution must provide athletic financial aid for the same duration. National Signing Day marks the start of many football players' careers as they transition into more professional setting. National Signing Day was established in 1981 by the College Football Association in an effort to eliminate separate conference signing dates and force student-athletes to commit to only one NCAA institution. Prior to 1981, NCAA football conferences required recruits to sign separate letters of intent since conference letters only restricted signing within the conference itself. 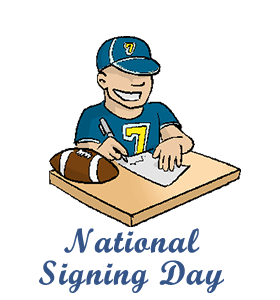 National Signing Day is now held on the third Wednesday of February annually. Although National Signing Day traditionally marks the first day for committing to a college, there's also an early signing period when many of the top talent commit to a school. There is a major debate on whether or not college athletes should be paid. In 2014, Ed O'Bannon won a lawsuit against the NCAA for profiting off of the images of student-athletes but not sharing the money with them. However, the original remedy by the judge to give the option to schools to place as much as $5,000 per year into a trust for an athlete was later rejected at the Court of Appeals. Different NCAA sports have different signing days where high school athletes from that sport can commit to the university of their choice. Prior to signing a letter of intent, prospective students usually go on a recruiting trip paid for by the university in question. The trip serves to show the recruit a good time and attempt to convince him/her to commit to studies there. According to the NCAA, of its 1,100 members, only 20 of them actually make more money than they spend on sports each year. Get out to your local park and play a game of football with your family and friends to celebrate all those who are committing to playing in NCAA football today. Watch the day's events of your favorite conference live. Most are aired live across networks such as ESPN and they can often be found online. Watch a movie about NCAA Football. Our favorites are Friday Night Lights (2004), The Blind Side (2009), Rudy (1993) and The Express (2008). Support a local high school football team. Your financial and time donations can mean the chance to get a scholarship for a high school student to pursue university studies.